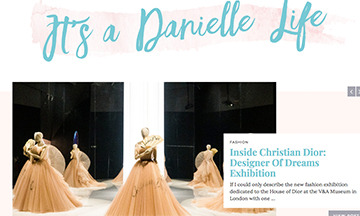 Danielle Wightman-Stone has announced the rebranding of her blog Fashionista Barbie to It's a Danielle Life, to mark 10 years of blogging. The rebrand represents a broadening remit to cover fashion, beauty, lifestyle, travel and interiors, as well as the adventures of her Welsh Springer Spaniel dog, Falcon. For more information visit itsadaniellelife.com.